Sue Huber, CPA, started with the UMMC team as a senior accountant in our Leesburg office in December 2018. She comes to us with more than twenty-five years of experience in public and private tax accounting and holds an accounting degree from Kent State University in Kent, Ohio. 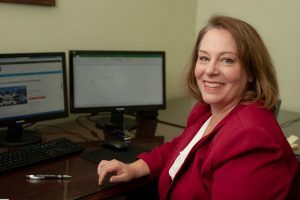 She will serve individual and business clients in the areas of tax preparation, tax planning, and accounting and is a member of the American Institute of CPAs and the Virginia Society of CPAs. Sue lives in Leesburg with her husband Jim, boy/girl teenage twins Jay and Serena, and dog Zippy. In her spare time she enjoys traveling to the regional parks to hike and being creative through arts and crafts.